WARNING: The British Foreign and Commonwealth Office (FCO) and the German Auswärtiges Amt (AA) state that "There is a high threat from terrorism" in Egypt. The East Bank of Luxor refers to the central part of Luxor township, centred on the twin foci of the Temple of Luxor and the Temple of Karnak. Unlike the West Bank, which was always the main area for cemeteries and mortuary temples, the East Bank represented the main settlement of the living throughout the millennia - a role that has hardly changed. The vast majority of hotels and tourist facilities are to be found in the East Bank. April 2010 The reconstruction of the centre of Luxor is largely complete...but now they're digging up the town centre to expose the twin rows of spinxes that lined the processional route from Karnak to Luxor temple. As a result, a large number of buildings including hotels, churches and,I believe, mosques together with many private houses have been or will be demolished. 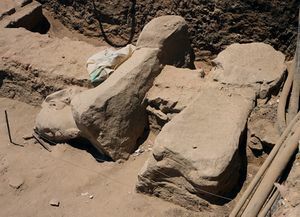 Some of the recovered sphinxes are in good condition for their age although many are just fragments which are being fitted into cement replicas. Completed major works include widening the main road along the corniche allowing the coaches from the Red Sea resorts to quickly access Karnak temple & the Valley of the Kings. the Karnak Open Air Museum - an off-shoot to the Karnak temple complex, accessed just before the Second Pylon at left, featuring an amazing array of statuary and reconstructed temple structures. Don't miss this! Ticket to be bought from the Karnak ticket office. Open 6AM - 5.30PM daily. Entry LE 15, LE 10 (student). Luxor Museum, open daily October-April 9AM-3PM and 4PM-9PM, May-September 9AM-1PM and 5PM-10PM, admission 80LE - located approximately halfway between Luxor and Karnak temples on the Corniche el-Nil. A small but quality collection of antiquities, mainly from the Luxor region. Includes most of the remarkable collection of pharaonic statuary found in a hidden cache within Luxor Temple in 1989, displayed in a special annex. Museum of Mummification, Corniche el-Nil, open daily October-April 9AM-2PM, May-September 9AM-2PM and 5PM-8:45PM, admission 60LE, 30LE (student), opposite the Mina Palace Hotel - as the name suggests, the small (one-room museum) but fascinating collection is devoted to mummification practice. They place is tiny. Well done but only one (human) mummy! Probably not worth the extra 50LE ticket to use your camera unless you're really into mummification--there is much, much more and better at the Egyptian Museum in Cairo. Pay a visit at the Brooke Hospital for Animals - and leave a donation! Visit ACE - Animal Care Egypt - it has new premises, and operates free for Egyptians. Donations are always accepted - but consider buying their clothing range or books, as a charity, they totally rely on such things. Pay a repeat visit to Luxor Temple at night - atmospherically lit, it has a completely different mood to that found in the daytime and is usually more intimate then with fewer visitors. 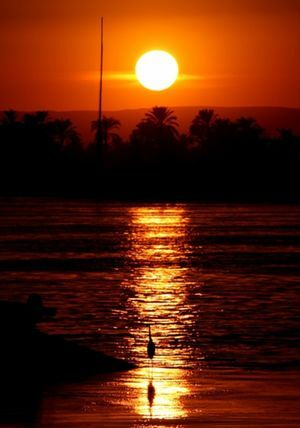 Watch the sun go down over the Nile: preferably from the terrace of the Old Winter Palace hotel, with a drink in your hand. Listen to cacophony from thousands of small birds that roost in the trees lining the Corniche. Take a walk along the Nile River. The section north of the mummification museum is fairly tranquil and tout-free. The atmosphere of the riverside walk resembles a nice park - a stark contrast to some of the dusty, damp streets farther inland. Al-Sahaby Lane  The restaurant is located next door to Nefertiti Hotel, in the souk, the colorful Egyptian market of Luxor, on Sahaby street. Jamboree Restaurant, Daily 10.30AM-2.30PM & 6.30-10.30PM. Inside the Souk. Ph: 010-146 1712, a spotlessly clean, air-conditioned establishment with roof terrace, serving a range of mid-priced Egyptian and international dishes of above average quality including Cajun chicken (LE 22.50), tasty jacket potatoes (LE 9-13) and a safe salad bar. Owned and run by two really friendly and handsome Egyptians, Mr. Hamdy and Mr. Amer. El Kebabgy, Daily 12.00AM-12.00PM. Below the Corniche, near the Winter Palace Hotel, it offers great views of the Nile & West Bank and inexpensive, decent quality food including pasta, grills (Kofte, kebab, pigeon), mousaka etc; by candle light at night. El Zaeem, Main road bordering the market, bright lights, two levels (sitting upstairs), 'chain' feel, red uniforms. Offers fresh simple and very cheap food such as shwarma and hawashi for 5 LE or less. Note that they have an Arabic menu with the 'correct' prices, and an english menu (or no menu at all) with made up prices for foreigners (anywhere between 10-25 LE for shwarma!). Therefore, reading arabic is a necessity for the local price! McDonalds, Behind Luxor Temple, provides cheeseburgers and a safe haven from the nearby souk. There is an excellent sugarcane drink place located near the train station, on the main road past the rotary. 6 LE for a cold, fresh bottle of sugarcane drink (1.5 liter). Various large chains like Hilton, Sheraton, Novotel and Steigenberger also have high-end hotels in Luxor. Luxor town has 4 telephone offices, allowing travellers to avoid the often hefty charges levied by hotels and mobile carriers for international phone calls. The main telephone office is on Sharia Karnak, adjacent to the souqs and almost opposite the Emilio Hotel. It is conveniently open 24 hours a day. Another, smaller branch can be found below the grand sweeping entrance to the Old Winter Palace Hotel on the Corniche (open 0800-2000); whilst a third telephone office exists at the railway station (open 0800-2000) and the fourth telephone office is in Sheraton street, next DHL office. If you wish to use your cell phone in Luxor, it is advisable to visit the Vodafone shop at the bottom of Television Street. You can buy a Holiday Sim Card, which costs 25LE, and you will avoid any roaming charges, even on international calls. Just top up the card as necessary. If your phone is 'locked' by your phone company, they will advise where you can get it unlocked for a fee of between 30-50LE. Or buy a local simcard at Mobinil shop, opposite Pyramisa Isis Hotel, here they sell special tourist lines active for a few days. Also available are microsimcards for iphone4 and ipad users (prepaid) so you can use 3G for local egyptian prices during your holiday. There is no shortage of venues in Luxor town to access the internet for email and browsing - the last few years have seen shops and food outlets both great and small venture into cyberspace as a new form of cottage industry. Shop around for the best deal, 1 LE for an hour or 0.5LE for half is often accepted. Luxor town's main post office is on Sharia al-Mahatta, not far from the intersection with Sharia al-Karnak. Open 0830-1430 daily. A smaller post office branch can be found in the Tourist Bazaar. The Luxor passport office is located south of the town centre, virtually opposite the Isis Hotel, open Saturday - Thursday, 8AM 4PM. You need to give your passport, 2 pictures, and copies of your passport (including entrance stamps) before 11:00 AM. Your passport will be returned at about 02:00 PM same day. Rumour has it that visa extensions are far easier to acquire at this office than in Cairo. If you want to buy stamps, you need small change because no one will sell you if you don't have it, and if you see an old woman at the stamp place, maybe, you will go back again because she doesn't want to work and do anything for you. She doesn't has a service mind. There is very bad experience with this post office. This page was last edited on 8 August 2017, at 20:15.